Gage One 1900 Gage body, one set of 1504-3 tips. Min.-Max. Dia. Range .730-6.875. three point contact. For use at machine or inspection area for checking inside and outside diameters, shallow bores, counter bores, pitch diameters of gears and many other dimensions. 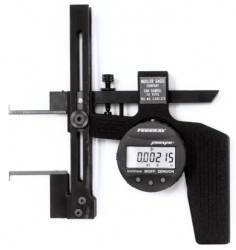 Most versatile gage available for checking groove diameters. Checks both inside and outside diameters. Designed and manufactured for long life - Many units in use for over 20 years. Hardened and hard chrome plated measuring tips. Gage easily set and used. Available as single gage or as model 1918 gage set. 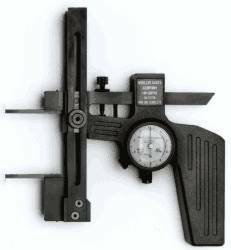 Model 1915-1 gage body is model 1915 gage less measuring tips.